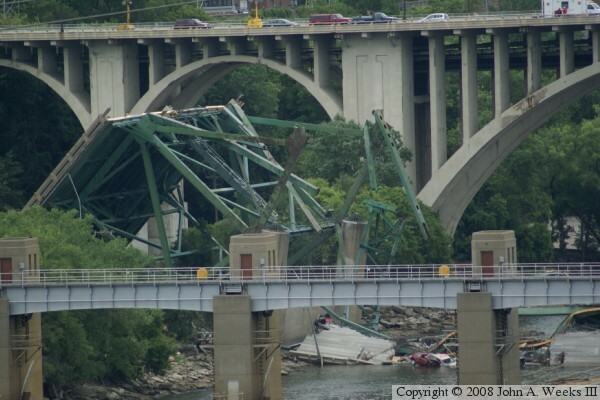 The busy Interstate 35W bridge over the Mississippi River in downtown Minneapolis, Minnesota, collapsed at the peak of rush hour on Wednesday, August 1, 2007. 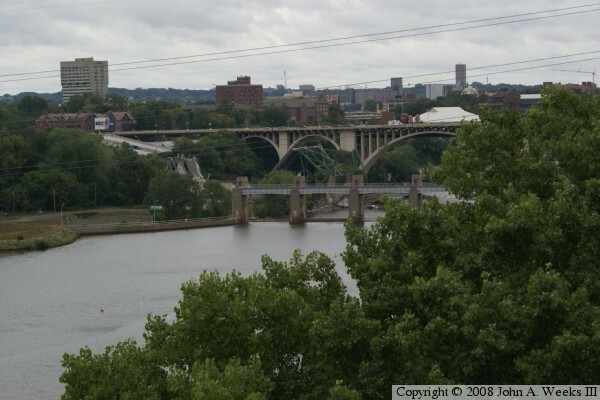 These photos are taken from the Endless Bridge at the Guthrie Theater, an outdoor deck that hangs out over the West River Road that offers a spectacular view of the Mississippi River and the Saint Anthony Falls area. 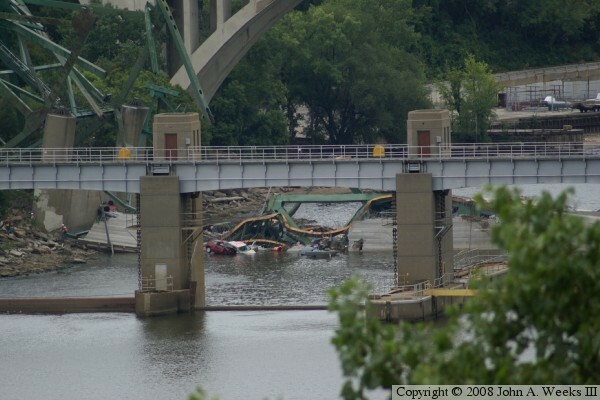 It is one only a few vantage points where you can legally see any of the bridge wreckage. 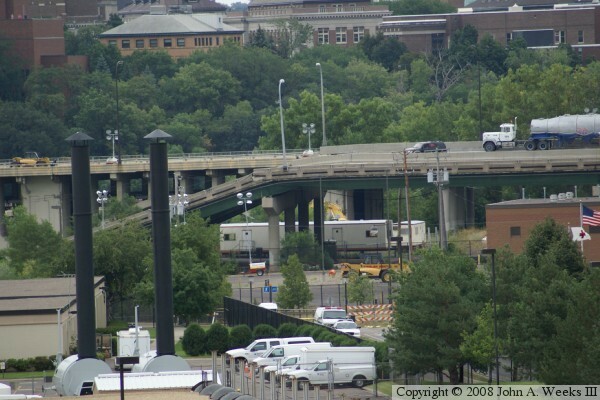 The photos are arranged from north to south, and we are looking east (towards the University of Minnesota). They were taken mid-afternoon on August 4, 2007, which happened to be a gloomy gray day. In fact, much of the weather in the two weeks following the bridge collapse was overcast and rainy. The photo above is a wide shot that attempts to give an idea of just how big of a disaster this was. The bridge was over 1900 feet long. Of that, about 1650 feet of the structure collapsed. We are able to see about 800 feet of the wreckage in this photo. The photo below is the far north end of the collapse. The bridge deck crosses a small railroad yard. In fact, the bridge landed on and smashed 5 rail cars that were parked under the bridge. Notice the blue van near the center of the roadway. The driver veered into the center divider in a desperate attempt to avoid going over the edge. This action almost certainly saved his life. These two photo show a section of the bridge between the two piers on the north end of the structure. When the center span fell, this section had no support, so it fell backwards, pushing the pier out of plumb and towards the river. 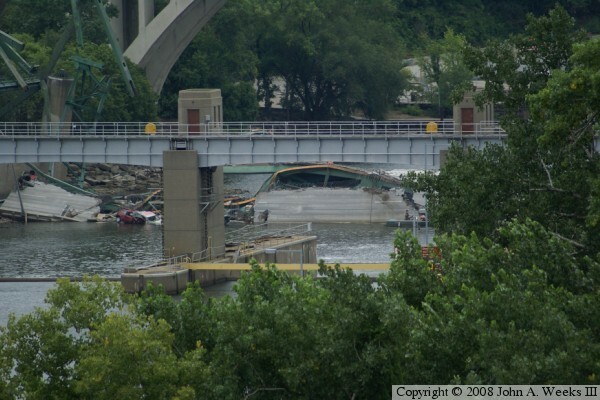 These two photos are more views of the bridge deck that landed in the water. There are several cars visible. There is also a boat with divers searching the water just to the right of the red and white cars. 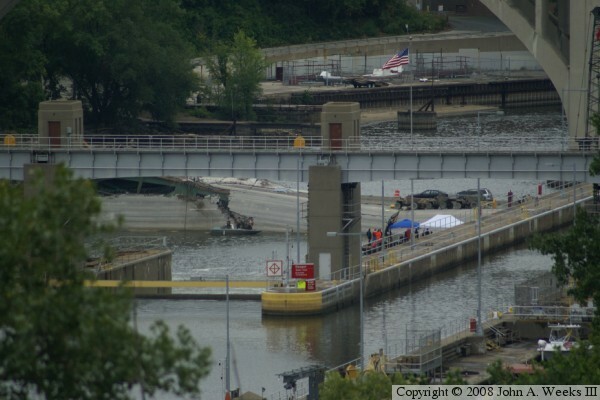 The photo above shows the bridge wreckage in front of the Lower Saint Anthony Falls Lock and Dam. Several tents have already been erected to support the diving and recovery activities. The vehicles that look like 4-wheel ATVs are actually concrete delivery wagons. They haul a small bucket full of wet concrete from the concrete delivery truck to the place where workmen are pouring the concrete. 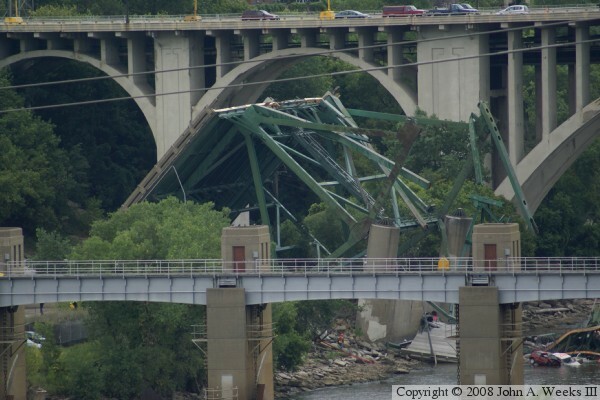 The photo below shows the southern most section of the bridge collapse. A few sections of the bridge did not fall, but those sections will eventually be removed. 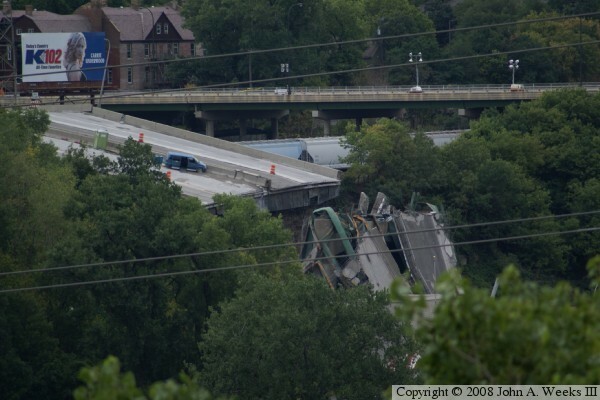 The bridge behind the collapsed section is the 10th Avenue Bridge, which is located only 200 feet from the I-35W bridge.